Let's continue with the items received while I was visiting my son. This time, we have a sort of trade package. I call it a "sort of trade", because once you trade me me I will just start sending you cards, especially hits I pull. It's nice to have a Giants fan in Adam from ARPSmith's Sportscard Obsession. It gives me a place to send anything Giants related, plus Adam is always a good blogger. Packages with his California address on them are filled with goodness. 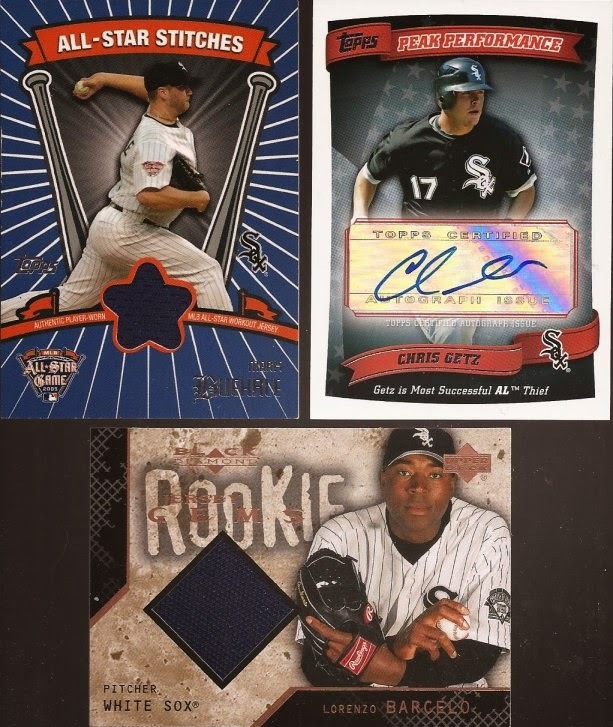 I pull both a Matt Cain relic and a Mike Kickham auto out of some blasters of GQ. I threw them in am envelope for Adam and said "whenever". Whenever came about two weeks ago, and whenever was pretty sweet. On my New Year resolution post, I said I wasn't going to worry about GQ and Heritage this year. Then I saw the cards and I really like the designs. I went a bit too much with both, and I am hoping to complete each set. Adam sent about 70 or so cards mixed between the two, so he gave my want list a good smack down. If you have wants for any 2014 sets, get me a list and I'll see what I can do to help. Some random Sox in the pack. Never saw the Thomas before. It appers to be part of some player set, and the borders didn't scan well - they're gold. The Sax in the middle was a former most wanted baker's dozen card, so I have updated the side bar. How well did I flip the Cain and Hickman? Well that's a pretty good deal if I do say so. Love me a Buehrle relic. The Getz fits into my Sox auto collection. That Barcelo is interesting. The relic is blue and thought it was another swatch from the Chicago American Giants unis the Sox like to wear, but the back says it's from a Team USA game. No matter - they are all great additions to the relic/auto binder. Thanks for the great cardboard, Adam.